Quite a while back, we made a big joke about there being a product called Trader Joe's Dog Food...For People. It's one of our finer works. Please, if you need a good laugh, take a peek, we'll be back. I bring this up because there's now apparently a TJ's bird food...for people. Yes, yes, I know, it's actually called Trader Joe's Nutty Seedy Fruity Bar, in yet another attempt on a grab 'n go snack/energy bar. It's not a bad concept, but the endless variations out there...and to my knowledge, none of them have tried to emulate bird suet anywhere as close to this one. Yes, suet, like that stuff you put aside in the winter for the birds, only for it to be snatched up by some darn squirrels. Happens all the time. Now, I've named each and every ingredient..but there's apparently 12% missing here. 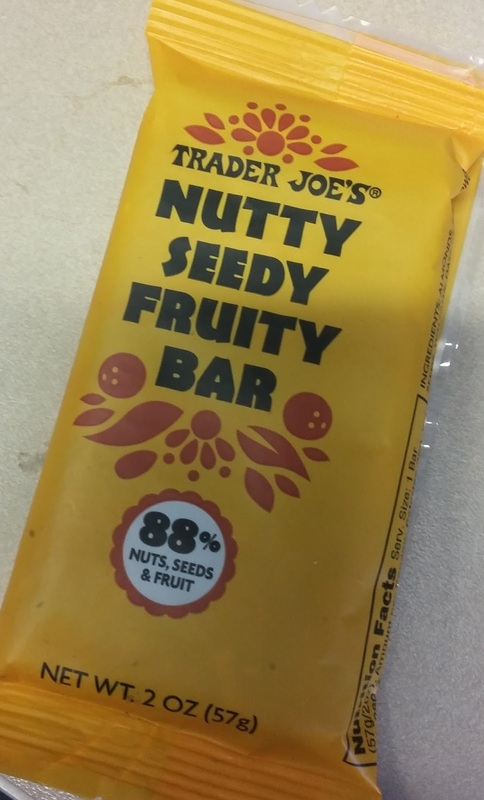 It says it's 88% nuts, seeds and fruit on the front. What's the rest? Tj's love and magic? Maybe. Anyways, all these ingredients come to together to a dense, chewy, crispy bar. This thing got some girth to it. It's very dry yet oily at the same time - some hydration will probably be handy to have on hand. It's not something to be gnawed right down. 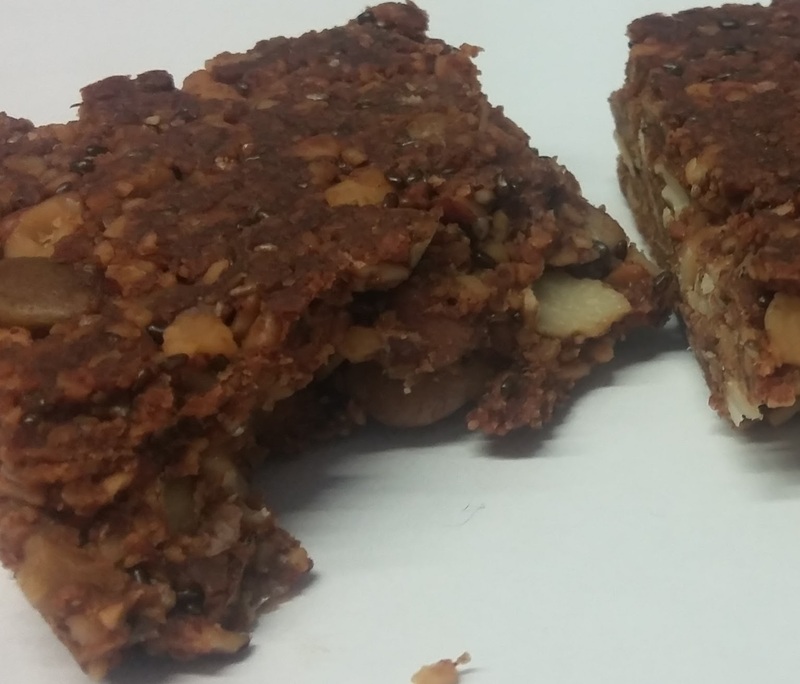 Each respective ingredient is present, with the dates and coconut really holding it all together. The nuts are pleasantly earthy and roasty, as are the seeds, with the right amount of proper crunch and crisp for each. It's a nifty little feat. But...I wish it played up the fruity element just a tad bit more. The dates are more adhesive than flavor additive, leaving mainly the coconut. Some dried blueberries would have a subtle little touch here, which would have also lightened it up a bit. There's a little too much earthiness, so as in life, a little sweetness would go along a way. Oh, if you haven't figured it out by now: There's nuts. And coconuts. Lots of fat. Lots and lots of good ol' natural fat of the saturated, polyunsaturated and monounsaturated varieties. Make of that what you will for you. It's not a huge deterrent for me - better this than a Big Mac, IMHO. The bars in all do make a nice little treat that packs more stomach filling power than one would think. I was quite happy for several hours after munching away on one of them at work, to the point where I almost forgot to eat lunch, which just doesn't happen for a guy like me. I like them, and for what it is, the $2.29 price tag isn't an outright awful value. I'd love that blueberry variety. Just me judging here, as unfair as that is, but Sandy didn't get to hers in time. I'll wing it a three, so double that up. Stock up for those hard winter months ahead. I snap things like this in half and stuff one half in a ziplock bag. They even have snack size zip bags now that would fit even better. Just don't forget where you put the bag or else you will end up with a lot of half-bars stashed various places. My TJ says this product is not available. Say it isn't true!!! I really like this product, and hope that this is a temporary out of stock.